Press Digest: Vietnam leader ushers in new era with historic visit to U.S.
RBTH presents a selection of views from leading Russian media on international events, featuring reports on Vietnamese leader Nguyen Phu Trong’s visit to the U.S., a letter written by a State Duma member to Facebook over censorship, and the new projects selected by the European Commission in its bid to find alternatives to Gazprom for Europe’s gas supply. The centrist daily Nezavisimaya Gazeta reports on the completion of the visit of Vietnamese Communist Party leader Nguyen Phu Trong to the U.S., the first in the history of bilateral relations. It was a step towards the recognition of the strategic nature of the new relationship, a relationship which until now Vietnam had only with Russia and China. 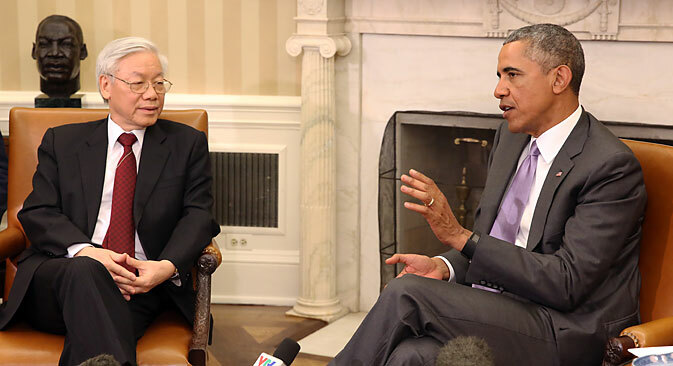 U.S.-Vietnamese relations will be strengthened in 12 areas. The strategic interests of Vietnam and the U.S. agree on a number of important issues, writes Nezavisimaya Gazeta. In terms of geopolitics, Hanoi is seeking to counterbalance the rise of its northern neighbor and its claims to disputed islands in the South China Sea. In this it has the full support of the U.S. In the area of economy, the U.S. is becoming the main driver and example of development for Vietnam. For 10 years, the U.S. has been the largest market for Vietnamese goods, accounting for about 20 percent of exports. The interest of American investors in the Vietnamese economy is growing due to the expected conclusion of a bilateral investment agreement and Vietnam's accession to the trading and economic bloc created by the U.S. in the Asia-Pacific region to counterbalance the Chinese draft agreement on regional free trade. The author of the article, Vladimir Mazyrin, head of the Research Center of Vietnam and the ASEAN (Association of Southeast Asian Nations) at the Institute for Far Eastern Studies at the Russian Academy of Sciences, explains that Washington’s leadership as a trade and investment partner for Vietnam poses a serious challenge to Russia's efforts to preserve and promote its comprehensive strategic partnership with Hanoi. Washington was able to take advantage of the unipolar world and the U.S.-controlled international financial system as well as the effects of the weakening of Russia to take root in Vietnam. According to opinion polls conducted by the Pew Research Center, 71 percent of the population of Vietnam and the Philippines welcome the expansion of the U.S. military presence in Asia. National daily broadsheet Izvestia reports on a letter sent to Thomas Christensen, Facebook Director for Relations with state power bodies in Northern and Eastern Europe and Russia, by a member of the State Duma Committee for Security and Anti-Corruption, Ilya Kostunov. According to Kostunov, “a large number of users of the Facebook social network are concerned about the proliferation of cases of extrajudicial censorship and blocking of accounts by the administration of the company.” The decision on the blocking and restrictions on the viewing of records in Facebook should be made only by the state authorities or the judiciary, Kostunov believes. If Facebook goes down that road to solve the issue, Kostunov is ready to assist the company in establishing contact with the judicial and executive authorities of Russia. If the Facebook administration wants to continue to engage in censorship on its own, it can be done with respect for the linguistic and cultural traditions of each country. The press service of Facebook told Izvestia that if the published content does not meet its standards, they take a decision upon receipt of complaints from other users. In addition, if a page or a profile have been removed, the corresponding user may appeal the decision, and they will process the application. Ivan Zasursky, head of the department of new media in Moscow State University’s journalism faculty, noted that Facebook is a private platform that acts primarily according to its own rules, then to American laws, and only then to the laws of other countries where they operate. “The Russian constitution prohibits censorship. What Facebook does is the rules of the platform. If you don’t like it, you shouldn’t use it. The deputy’s initiative will not change the situation. Facebook is more likely to respond to the public opinion of its users, expressed primarily in the form of specific complaints against postings and statements,” said Zasursky. The business daily Kommersant reports that the European Commission has selected four priority gas pipeline projects in the Balkans, which should increase gas flows between the countries of the region and reduce their dependence on the now-single supplier, Gazprom. After the abandonment of the South Stream pipeline, which was to have brought Russian gas to Central Europe via the Black Sea and the Balkans, the European Commission was forced to urgently look for new ways of supplying gas to South-Eastern Europe. Brussels proposes to provide Greece, Bulgaria and Serbia with Azerbaijani gas by building two interconnectors, and Hungary and Slovenia with LNG from a future terminal in Croatia. According to the newspaper, this creates a real alternative to Russian gas, but the capacity of the interconnectors will be insufficient to eradicate the need for it completely. “The construction of interconnectors in South-Eastern Europe can only be welcomed, but for them to operate new gas resources are needed, which are not available,” Alexei Grivach of the National Energy Security Fund (NESF) told the newspaper. He also stressed the problems with the financing of such projects, because their load cannot be guaranteed in the absence of contracts for the supply of gas and, consequently, loans cannot be attracted under these guarantees. According to the analyst, some of these projects, particularly the Greece-Bulgaria- Serbia interconnectors, may be used by Gazprom in the implementation of its Turkish Stream project to link Russia to a distribution hub in Turkey via a pipeline under the Black Sea.